Welcome to Live, Laugh, Cook, Eat and my first blog post! Yea, it’s another food/recipe blog written by another home cook who likes to think she’s something special in the kitchen. But hey, I’m an award winning home cook. Impressed? Me neither. I don’t like to take myself too seriously. Hence the word “laugh” in the title of my blog. I laugh at myself a lot. Hasn’t it already all been said (or cooked) before? What if I run out of things to write about (although my husband tells me I have plenty to say)? What if it turns out people don’t care? Well, I decided that I care. A big part of me is about cooking and competing. The recipe contests, the cook-offs (complete with the thrill of victory and the agony of defeat) and the travel. I have a lot to share about the great friends I’ve met through cooking, the wild times at the cook-offs, the exotic (and sometimes not so exotic) travel and, of course, the recipes. People tell me all the time that I should write a cookbook. Ahhh, but that’s hard work. A blog will be more fun. Right? And much to my chagrin, I’m often treated like a celebrity in my home town because of all the press from the cook-offs and a few television appearances. I really don’t feel like a celebrity, but the recognition has given me the opportunity to give back to my community on occasion by donating prepared and catered meals to local charities through silent auctions and other types of fundraisers. And people (mostly other foodies or cooking enthusiasts) often ask me about the cooking competitions and the real celebrity chefs I’ve met (like Bobby Flay, Duff Goldman, Tyler Florence, Ree Drummond-The Pioneer Woman, and Sara Moulton, just to name a few) and my experiences at the Pillsbury Bake-Off and at the Food Network Kitchens. I’m happy to share! And boy, do I have stories . . . . so I started this here little ol’ blog. I thought I’d start out with something that’s all about my hometown. As some of you know, I am lucky enough to have lots of citrus right in my backyard. With 2 lemon trees, a lime tree, a navel orange tree and a tangerine tree, I tend to use lots of citrus in my recipes when it’s in season. 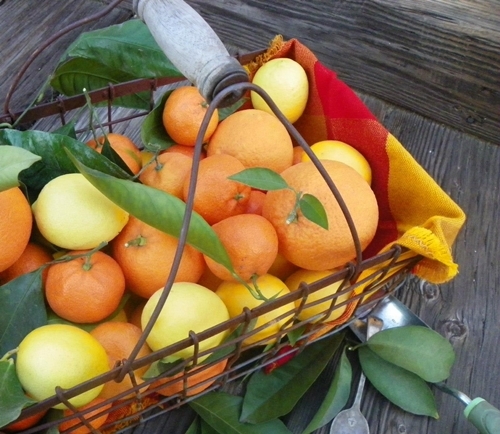 Did you know that my hometown is rich with citrus history? In fact, the navel orange is a Riverside treasure. It is actually a mutation from an orange tree that grew in a Brazilian monastery in the 1800’s. The U.S. Department of Agriculture obtained cuttings from the tree in Brazil in 1873 and sent two or three starters to spiritualist and woman suffrage activist Eliza Tibbets here in Riverside to see if they would grow. Turned out that Riverside’s climate was perfect for the citrus. “The trees produced incredible oranges—huge golden globes that outshined every other citrus table fruit around,” wrote noted California historian Vince Moses. 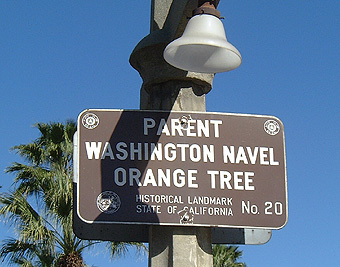 “[The navel orange] was the key to the establishment of the California commercial citrus industry.” Riverside grew to become the citrus agricultural hub of California. Today, nearly all of the navel orange trees grown in the state are descendants of the Tibbets’ original trees. 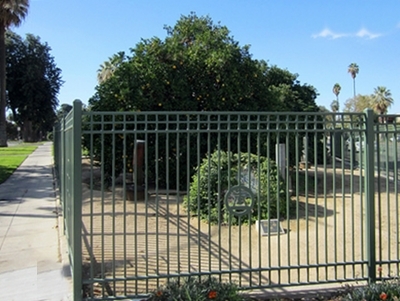 One of those trees, now 137 years old, still stands and bears fruit in Riverside, and has been designated as a California historical landmark. The following recipe is a lightened up and simplified version of a winning recipe originally submitted to Country Woman magazine as Pan-Fried Catfish with Spicy Pecan Gremolata (October/November 2011, p. 34). I’m using salmon here and pan roasting it instead of frying to lighten it up. The citrus flavors in are amplified with the addition of the fresh juices in the citrus “bath”. Place the first 8 ingredients in a food processor and process (pulse) until ingredients are combined and chunky. Set aside. In a small bowl, whisk together the citrus juices, the honey and mustard. Set aside. Brush the salmon fillets with olive oil and season with salt and pepper. Heat a skillet over medium-high heat. When the skillet is hot, add the salmon. Cook for 3-4 minutes, or until nicely brown. 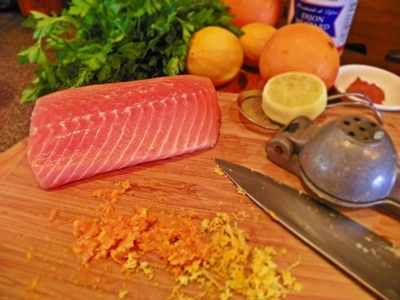 Turn salmon over and add citrus bath to the pan, pouring it over the salmon fillets. Cook the salmon for 5-7 minutes, or until cooked through. The salmon is done when it flakes easily with a fork. The citrus juices will reduce a little as the salmon finishes cooking. You can add a little butter to the juices and spoon over the salmon before serving, if you desire. 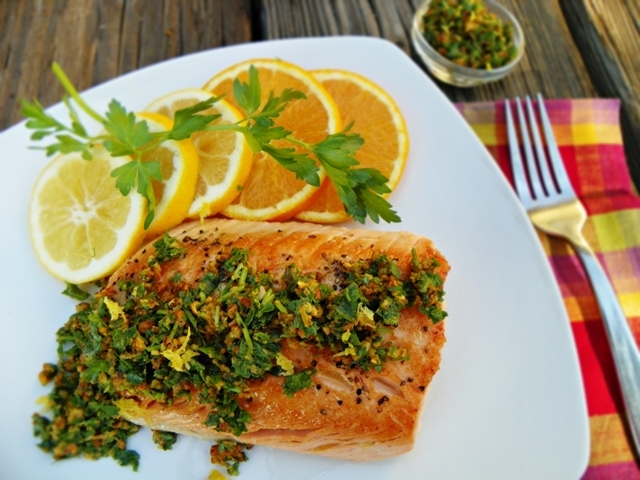 To serve, sprinkle a little gremolata on top of each piece of salmon. Welcome to the blogging world! You are going to do just fine. Your writing is entertaining and your recipe is approachable and delicious. Bravo! I can’t wait to see what you cook up next. Great writing and a delicious recipe-glad you jumped into the pool! Congratulations on your new blog! I’m glad you care; I think it’ll be a sweet ride. Learned some citrus history today and the recipe sounds delish! Keep ’em coming. Really looking forward to your posts….have loved getting to know you a ‘bit’ via Lisa & can’t want to see what you have next! I’m one of those people who ‘wants to WANT to learn to cook’! Great salmon recipe ~ I’ll let you know if I try it! So happy you are blogging, I look forward to reading your posts! Laureen, I love salmon and hope to try this recipe soon!!! Congratulations on your blog!!! Look forward to more…..! Fun Blog, I’m not really a big fan of cooking but I thought the first installment was fun and informative. I’m hoping that one day you will post a tasty recipe that’s quick and easy for us bachelor types. Looking forward to seeing your next blog way out here in New Jersey! Very nice! And I learned a little history too! I am glad to see your blog up! I have to figure out how to print out the recipe for my husband to cook. He doesn’t “do” computers, and I don’t cook! Perfect team. Welcome to blogging! I will add you to my “bake-off bloggers” list on my blog. Nicely done. Can’t wait to read more posts. Wow! Great blog Laureen! Excited to read your posts and try out your fabulous recipes. Wow! Tremendously fascinating review. I happen to be storing the site today. Thx!